CIMA is the world’s largest and leading professional body of management accountants. Our mission is to help people and businesses to succeed in the public and private sectors.We have more than 227,000 members and students in 179 countries. They work at the heart of business in industry, commerce and not for profit organisations. We have strong relationships with employers, and sponsor leading research.We constantly update our qualification, professional experience requirements and CPD programme. This ensures that our members and students are first choice for employers who are recruiting financially trained business leaders.We are committed to upholding the highest ethical and professional standards, and to maintaining public confidence in management accounting. By connecting your studies at UE with the prestigious CIMA certificate, you will significantly increase your attractiveness in the eyes of employers. CIMA provides you with the most up to date knowledge from the area of finance and management accounting and teaches you the abilities of strategic thinking and explaining complicated business processes. It supports you with the tools necessary for decision-making processes and analysis of financial as well as non-financial data. It has been confirmed by the positive opinions of managers employed in global companies such as Unilever, Capgemini Consulting or Nintendo. To learn more about CIMA and its educational path, see the presentation of Jakub Bejnarowicz, Head of Central and Eastern Europe, CIMA and the CIMA_Programme presentation. The condition for obtaining the certificate or diploma is completing the particular set of courses on the Bachelor and/or Master level of studies and passing one external CIMA exam in English. Choose the qualification UE & CIMA Certificate in Business Accounting (UE & CIMA – CBA) and/or UE & CIMA Diploma in Management Accounting (UE & CIMA – DMA). The studies end with obtaining the UE Bachelor/Master diploma and CIMA Certificate/Diploma. Learn how to obtain full qualification and become a CIMA member. In order to become a CIMA Institute member, it is necessary to pass all 15 exams and prove appropriate work experience (minimum 3 years of experience). Learn more about management accounting here: Zasady rachunkowości zarządczej (in Polish only). What can you do already? It’s easy! During your Bachelor/Master Studies join the UE & CIMA Programme, pass selected subjects and sit the CIMA External Exam. Why study with the Programme? get the support of the Ambassador and quick access to information about what is going on with CIMA in Wrocław and other locations in Poland. Remember, at WUE you do not pay any additional fees for participating in the Programme, the only fees you need to cover are the CIMA fees. If you choose the individual CIMA student path you are on your own. If you are eligible, better join our Programme! To learn more, get acquainted with the Regulations Tab. You can access the registration form here! WUE & CBA and WUE & DMA registration is now open. The registration will remain open until the 31 of October 2018. 15th of April at the PURO Hotel in Wrocław, the next edition of the event “Excam success – how to pass the exam” took place. A group of over 20 people participating in the CIMA professional certification had the opportunity to learn all the necessary secrets on how to prepare for CIMA exams. Thanks to a lecture by Mr. Tomasz Kociun ACMA, CGMA, participants know how to plan their time and what to devote the most attention to. So… CIMA is up to the point! 9th of April – the day when results of Financial&Management Accounting Quiz were resolved. Wrocław University of Economics showed the proverbial claw, stood on the podium and won prizes. The winner was Jacek Korczyński. Congratulations! Wrocław University of Economics versus University of Wrocław contest behind us. 2nd of April, more than 40 students approached the competition prepared by the Science Club Auditor and RekFin. Questions and tasks were created thanks to the help of our lecturers. F&M Accounting Quiz was at a very high level, but it was worth to be well prepared, because next Tuesday (09.04.) at the Gala, the best of the best will receive attractive prizes funded by the competition partners – CIMA and PwC. 28.03.2019 – it was a day when CIMA Ambassador – Wiktoria Gębska had a pleasure to take part with CIMA in Career Days organised by AIESEC Polska. It was really nice event – full of positive energy, great and smart people, awesome expositors and possibility to talk with CIMA partners – EY and Credit Suisse. Students had opportunity to meet potential employers and take care about their work career. 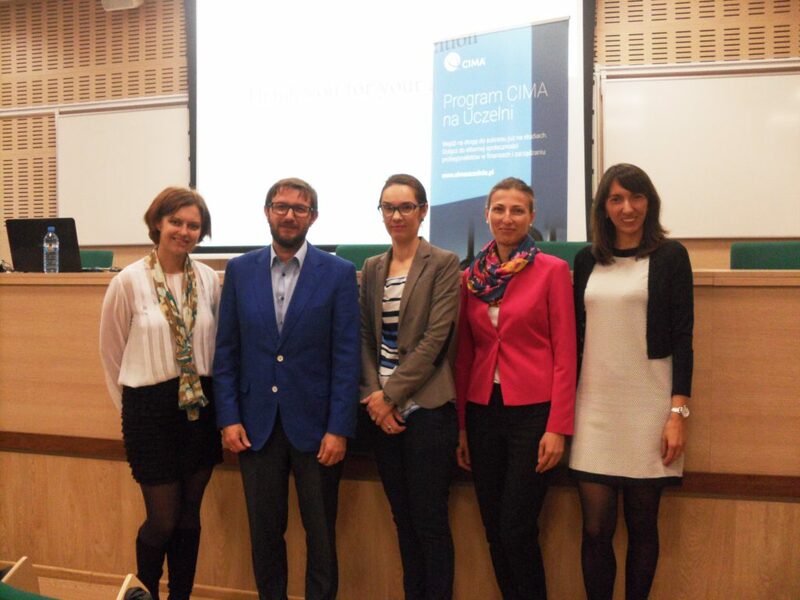 They also had the possibility to expand their knowledge about CIMA Programme at the Wrocław University of Economics. 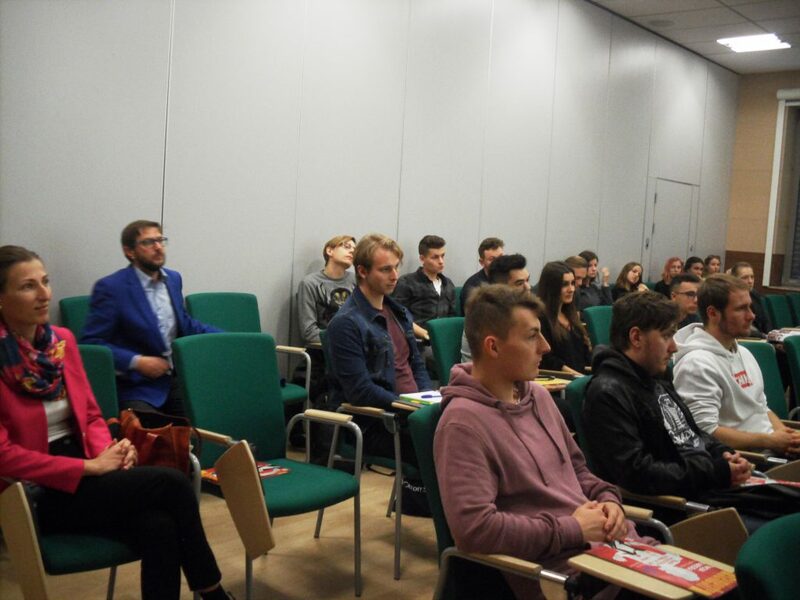 On March 28 the Induction Meeting of new students of the CIMA Programme at the Wrocław University of Economics took place. Apart from Mrs. Sylwia Dubiel, who is the Associate Manager, University Partnerships, CEE – Management Accounting, CIMA, the Programme Coordinators also spoke and the guest was Katarzyna Lewicka from the WIGGOR (Student Association) who coordinated this year’s Karierosfera. On the occasion of the next edition of Economic Bridges (Mosty Ekonomiczne), on March 4 in Wrocław, students from various polish cities, including Katowice and Poznań, had an intense day full of various workshops and meetings. In the afternoon, dr Maria Nieplowicz shared with them the knowledge of a balanced personal scorecard. After the initial theoretical part, there was time for a practical part, during which all students could work in groups on a case study. On 25 February 2019 was organized event by the Chartered Institute of Management Accountants and student association Wiggor – Karierosfera. The meeting was held for another time in Wroclaw and aimed to familiarize students with the practical aspects of balanced scorecard. About 30 students had the possibility to listen to the lecture given by dr Maria Nieplowicz. 5th November 2018 the Chartered Institute of Management Accountants and the Faculty of Management, Computer Science and Finance at the Wrocław University of Economics organized the event: University Management Accounting Day (UMAD). The meeting aimed to familiarize students with the practical aspects of management accounting, to create an opportunity to meet representatives of companies employing high-class specialists as well as to realize that by gaining international qualifications one can definitely stand out in the labor market. 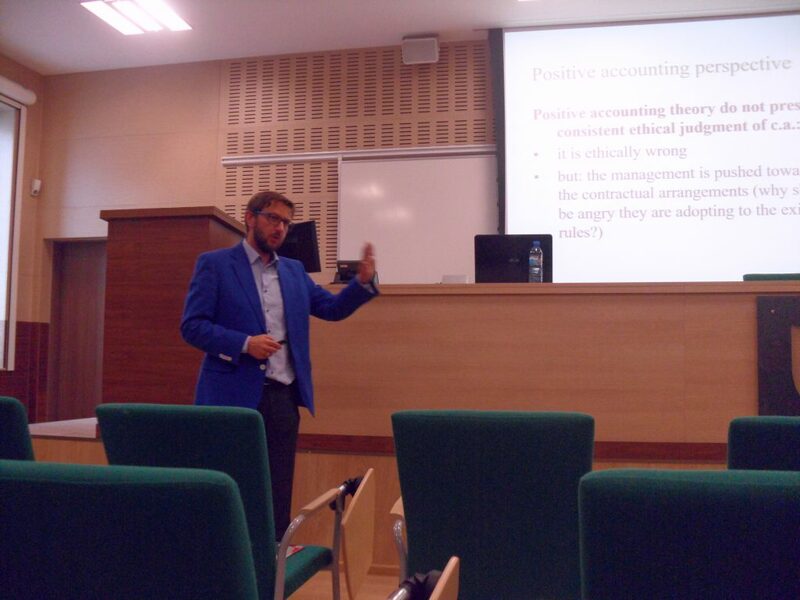 Students had the possibility to listen to the lecture given by dr Wojciech Hasik about „Creative accounting – is it ethical? Is it legal?”. Also Ms. Alicja Dworowska – Hewlett Packard Enterprise Finance Manager – told students about her success in getting ACMA&CGMA title. During UMAD, students could talk and ask questions about the CIMA Programme with the Programme Coordinator and the CIMA Ambassador. 4th October 2018, during the Inauguration of the Academic Year 2018/2019, CIMA entitled Wrocław University of Economics the official University Partner. UE & CBA and UE & DMA registration is now OPEN. The registration will re-open on the 1st of October 2017 and will remain open until the 31 of October 2017. You can access the registration form for UE & CIMA at www.cimauczelnie.pl. Meet us in WUE during the Management Accounting Day on the 19th of October! The participation on the event is OBLIGATORY for all students in the CIMA specialization, as well as for those who are interested in starting such specialization this year. Come to Job Fairs, meet the CIMA Ambasador and take part in lotteries to win CIMA gadgets! To find out more visit http://www.biurokarier.wroclaw.pl/students/12812/job_fairs.html or contact Beata Dzidzińska (contact details available in the Contact section of the website). You can access the 2017/2018 CIMA Programmes Participation Regulations here. You can access the 2015/2016 CIMA DMA Participation Regulations here. Access Annex to CIMA CBA regulations here. Access Annex to CIMA DMA regulations here. Access the information about your benefits for participating in the Programme here. Access current information about CBA and DMA fees here. You can access the letter for student organisations here. You can access CIMA Programmes resignation letter here. For resignation procedure, please follow the current (most updated) regulations Annex.